London, The Arab Weekly – Thousands of British tour­ists have returned to Brit­ain but thousands more were stranded in Sharm el-Sheikh, Egypt. Making the reverse journey, Egyptian Presi­dent Abdel Fattah al-Sisi’s first state visit to London was overshadowed by Britain’s decision to halt flights to the Sinai tourist resort. British attempts to return about 20,000 tourists from Sharm el- Sheikh continued as confusion reigned, with UK and Russian of­ficials increasingly certain that Metrojet flight 9268 was brought down by a bomb while Cairo con­tinued to refuse to concede foul play. Estimates vary as to when all British tourists would return, with some officials saying that it could take as long as ten days due to heightened security procedures amid scenes of confusion at Sharm el-Sheikh airport. “It was madness. Their [the Egyp­tian] security is terrible and they are completely overwhelmed,” Brit­ish tourist Marc Standen, 28, told the BBC on his return to the United Kingdom. He also blamed airlines and authorities. “They don’t have it under control,” he said. Other tourists initially took a more laid-back view, happy that their holiday had been inadvert­ently extended. But things took a turn for the worst on November 6th following reports that a Brit­ish passenger jet had come “within 1,000 feet” of a rocket over Sharm el-Sheikh and had to take evasive action. Egypt Foreign Ministry spokes­man Ahmed Abu Zeid dubbed the claim “preposterous”. “The incident involved a ground-to-ground fire exercise at a military base a few kilometres from Sharm el-Sheikh airport… [There was] no ground-to-air firing involved what­soever,” he said. British tourist Chelsea Benson expressed relief on her return home. “It’s such a massive relief to be home, I’m just glad about that now, but there are still passengers out there,” she told the Manchester Evening News. Britain suspended flights to Sharm el-Sheikh on November 5th after revealing that it had uncov­ered evidence linking the Islamic State (ISIS) to the Russian passen­ger jet which crashed October 31st killing all 224 people on board. While Cairo and Moscow initially downplayed suggestions of terror­ism, many countries — including Russia — suspended flights to the Red Sea resort and worked to return tourists home. The Egyptian government said it was premature to say the plane was brought down by terrorists, call­ing for other nations to wait for the findings of the official investigation into the crash without specifying a time frame for when that investiga­tion will be released. Sisi’s November 4th visit to Lon­don was largely overshadowed by the British flight-ban decision, with reports that the Egyptian delega­tion had been blindsided by British Prime Minister David Cameron’s or­der to halt flights. 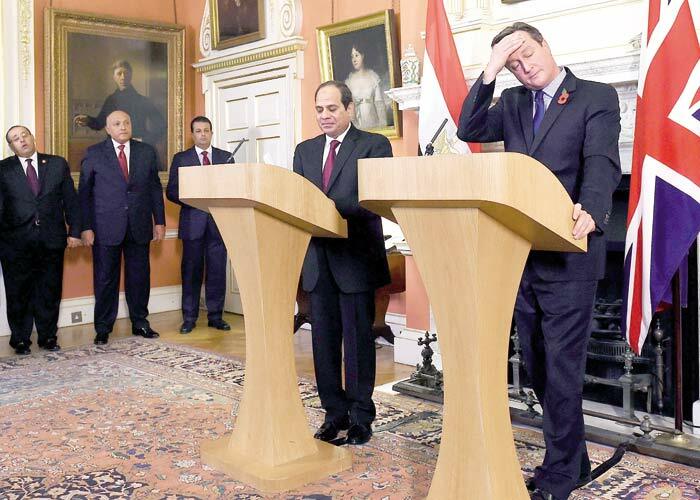 In his news conference with Cameron at 10 Downing Street, Sisi appeared torn between defending Egypt’s security record and acqui­escing to the demands of his British ally, while Cameron also sought a middle road between cooperation and censure. “Egypt is a vital partner for us both in terms of our economic and our security ties. We’re proud to be the largest foreign investor in Egypt and we want to help support growth and development in Egypt,” Cameron said. But he made no move to publicly explain why his government had taken the decision to not inform Sisi that it was halting flights to Sharm el-Sheikh and return tourists to the United Kingdom. “We’ve discussed the Russian plane crash and the situation in Sharm. We’re working intensively together in the spirit of close coop­eration and I’m immensely grateful for all the efforts the Egyptian au­thorities have made so far,” Cam­eron added. Sisi hailed the “strong relations” between Egypt and the United Kingdom, speaking of a political will on both sides to “enhance and upgrade” bilateral relations. However, the Egyptian president also made sure to defend his coun­try’s security record, particularly airport security, underlining that British teams visited Sharm el- Sheikh airport ten months ago and were “happy” with Egyptian secu­rity. “We are completely ready to co­operate with all our friends to make sure that the security measures tak­en in our airport provide the safety and security needed for the people who come to Egypt,” Sisi said. But senior Egyptian officials have complained that the intelligence that led Britain to halt flights has not been shared. “We expected that any technical information should have been shared with us, at a tech­nical level, before publicising it in the media,” Egyptian Foreign Min­ister Sameh Shoukry said on No­vember 7th.